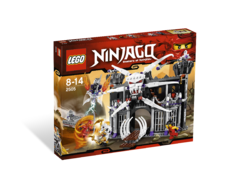 2505 Garmadon's Dark Fortress is a Ninjago set that was released in 2011. The set contains a fortress made mainly out of black, grey, purple, and white pieces, with some red, has a brown drawbridge, and is armed with flick-fire missiles. It also includes Lord Garmadon's throne which doubles as a flying machine and a giant skeletal underworld spider that attatches to the fortress. Other Minifigures include Kai, Nya, Samukai, Chopov, and Bonezai. Their names were mixed up in the January 2011 catalog. This is a description taken from LEGO.com. Please do not modify it. (visit this item's product page) Battle for the weapons of spinjitzu at Garmadon’s Dark Fortress! The set in its entirety. On the Spring 2011 catalog mistakes were made on the naming of minifigures. Samukai and Chopov also had their torsos switched. Facts about "2505 Garmadon's Dark Fortress"
This page was last edited on 9 January 2016, at 05:23.